The Devi resides at the central bindu of Sri Yantra. There are total 108 Devis in the 9 avaranas of Sri Yantra. Ganesha, Soorya, Vishnu and Shiva recide at the four corners of the Sri Yantra. All the 8 Lakshmis, Saraswati, the Nityas,the Yoginis and in fact every Devi controlling each and every aspect of our life and the world reside in the Sri Yantra. the North and Ishana guards the North East.As if this is not enough, each of the first eight Avaranas are guarded by eight Bhairavas and eight Bhairavis! What is more these 64 pairs of Bhairavas & Bhairavis are assisted by 10 million yoginis each – total 640 million (64 crores). This is what the verse in Lalita Sahasranama says –Yes. Reaching Her is a bit difficult! The Shri Chakra is also known as the nav chakra because it can also be seen as having nine levels. By seeing a shrichakra with devotion, one attains the same merit as having performed hundreds of fire sacrifices. By seeing a shrichakra , one attains the same merit as performing sixteen kinds of charities including kanya dana, godana, svarna dana etc. By seeing a shrichakra with devotion, one attains the same merit as bathing in innumerable tirthas. By worshipping shrichakra as prescribed by the shAstras, one attains the same merit as installing innumerable shiva lingas. SRI CHAKRA MERU also gives mental peace and stability. It nullifies Vastu Dosha and brings Harmony. It protects the person from negative energy. Shri Yantra Sthaapana in your home/office/vehicle is done on a Friday. Soak in saline water overnight (Thursday night). This takes away all negativity from the crystal. Then take it out, wash in normal water and keep on moist earth (mud) under sunlight for few hours. Then take it for Puja. Place Yantra on a plate and wash it with water, and milk mixed with saffron. Then wash it again with water. Light incense and sprinkle water where the Yantra is to be kept chanting “Aim Hreem Namah”. Place yellow cloth and a sheet of silver/gold and place Yantra on it. Put Kum Kum/ Sandal paste Offer flowers (yellow), (jaggery), raw turmeric and incense to the Yantra. Then cover Shree Yantra with red cloth. Pray and worship every Friday without lifting from Seat. Every Friday take off the red cloth and offer fresh flowers and offer jaggery, turmeric and incense to the Yantra. Meditation is done on the tip of the Shree Yantra and while chanting Mahalaxmi Mantra concentrate on the tip and meditate with open eyes. 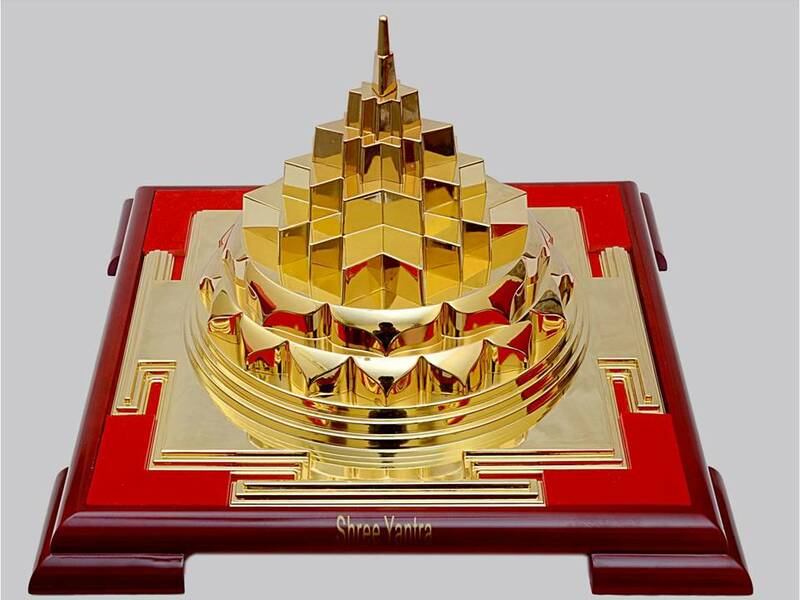 Sri Yantra or sri chakra meru works on the cosmic ray theory, apart from Hindus even Muslims, Christians and people following other religions also believe in it because they believe in the cosmic ray theory they can keep at the place of worship. They also concentrate on the tip and meditate with open eyes. Almost every Shree Yantra available in the market is made by Prohibited Metals with Brass or Bronze. It is mentioned in ancient Shastra that Shree Yantra made by gold, silver and copper gives all-round success, and prosperity. Lord Shiva created 64 Yantras and 64 mantras of various deities to attain various objectives and siddhis. Q: Is Maha Meru primarily a Hindu Yantra? A: I would prefer to say that it’s a universal yantra, belonging to all religions – yantras resembling this one include the Sri Chakra of Hinduism, and the Mahayana Mandala of Buddhism. Chinese feng shui employs similar yantras. The Egyptian Pyramids are yet another form of this yantra; the Greek Eleusinian Mysteries involved still another. So I have found this yantra to be a universal concept, existing in all religions. As a fairly recent example, there was a gentleman in the United States called Bill Witherspoon, who used to meditate for four or five hours a day. At some point he saw a huge Sri Yantra in his meditation, and he built that same yantra in the Arizona desert, measuring a mile on each side. For anyone who meditates, including the Himalayan masters, these yantras keep appearing again and again and again, in various religions and in various forms. Q: What is the specifically Hindu interpretation of Maha Meru? A: It is worshiped as the source of the Cosmos and of all power. It creates and sustains the entire Cosmos, and we should therefore strive to understand, worship and realize this power and intelligence that runs the world. The Khadgamala yoginis [i.e. the goddesses that inhabit Sri Chakra] emanate like rays from Sri Lalita, the Maha-Devi [Great Goddess] at Sri Meru’s center. All gods worship Her power in order to share it and to do good; all demons worship Her power in order to loot and exploit. The Meru is one form of the power and beauty found in the principles of geometry and symmetry that govern the world. Aspects of Her immense powers are variously called Yoga-Maya, Durga, Kali, Vaishnavi, Chandika, Lakshmi, Saraswati, and so on; like the fruits of a wish-fulfilling tree. Various scriptures – such as the Shakti Upanishads, the Brahmanda Purana, the Sri Chakra Samhita, the Sri Chakra Yoga Sara, the Sri Chakrartha Sara and others – all state in a single voice that merely seeing the Sri Chakra washes away all sins and grants auspiciousness. A mere touch burns away sin like a wad of cotton wool consumed by a fire. Even if one does no puja, just keeping it in the home attracts all good to the home. And if one worships the Supreme Power in the Meru with devotion, there remains no desire unfulfilled; one experiences infinite enjoyment, both here and in the hereafter. People of all castes and religions, especially women, may – without the slightest doubt – keep it in their homes and worship it in any way they can. There is no siddhi that cannot be attained by regular worship of a faultless Meru. Q: Should the Maha Meru be kept in places other than the home or temple? A: It can be kept anywhere. If kept in the home, it will connect itself to all the other yantras in the world through its Bindu and attract organizing, peaceful and loving vibrations from wherever they are in the world. It is also a good thing to keep in hospitals, as it has healing properties. Or it can be kept in the office, because it attracts wealth, abundance and organization in the office. It is good to keep in public places too, because there will be an aura of grandeur and peace coming from this yantra. So it’s a universal symbol, which can be kept anywhere and everywhere. Q: Should we do puja to the Maha Meru? A: You can do puja if you wish to, but that does not imply that it needs puja. When the Maha Meru is taken from the Guru’s hands, it is already energized with his vibrations and powers. Since it then connects itself with the all other yantras in the world, it continuously receives vibrations and powers from all over the world, including the cosmic centers of power. It receives abundance and grace, and redistributes them in its own vicinity. Thus, by itself, it does not need any puja as such. However, the nature of the vibrations it radiates can be enhanced very positively if you play soft music in the place where it is kept – similar to what we see in the entrance lobbies of hospitals and hotels, and so on, where soft music is played to bring about a peaceful attitude in the people who enter these places. So if you can do pooja to the Meru, well and good. If you can’t, you just play some soft music to it. It will absorb the vibrations and emit divine music that protects and heals, that wards off evil and brings prosperity. And not merely currency, but all forms of divine blessings of peace – love, truth, non-violence; principles that empower everyone. Q: Many people are fond of keeping a Maha Meru in their homes as a kind of protection for their families. Why is that? A: The Maha Meru represents the Cosmic Power as it manifests itself through human beings. 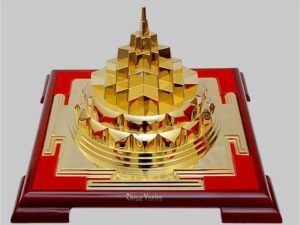 Life itself is derived from this yantra, and when it is kept in the home it enhances the quality of life for all the people living there. Actually the temples made by human beings are constructed of rocks, cement, steel and things like that – whereas the temple that the Goddess has made, is simply the body of human beings, ourselves. In a sense, your body is itself a Sri Chakra, a yantra in which the Awareness, the Goddess, lives. If you can live in your body, if your awareness can live in your body, then why can’t it live in your home? Q: But what do you say to people who are afraid to bring a Meru into their home (or other environment)? After all, there are those pundits who say a Meru should never be kept in the home. A: These fears are mainly induced by certain members of the orthodox Brahmin community, who insist that the power should be kept with them only. We’ve got to get over this barrier of fear. We want to give, to share the power with everyone. So I would tell these people to please not succumb to the misinformed, thoughtless statements being made by these so-called pundits, and thus miss the chance to obtain the power than can alter your destiny in every way. The Vedas say Matru Devo bhava: “There is no duty higher than worship of the Mother” – and the Mother is available to everyone as the Meru, Her highest form; other forms being icons or women empowered as the Goddess. So keep a Meru in your home; give it as a gift; think of it as a long-term investment – like having a good spouse! Don’t compromise on quality. Pay any price, because it is priceless. The Meru is a symbol of our power to overcome evil, and to create unlimited wealth, health and happiness. The Meru is Gayatri, who protects those who utter Her name; it is Savitri, who conceives all good karmas for Her worshipers. Q. Just to clarify, does this statement apply to everyone? Can the uninitiated also keep Sri Chakra Merus in their homes without incurring the wrath of the Goddess? A. Yes, absolutely. How can nectar become poison? It is not in its nature to harm. It is in its nature to bless. The hand that blesses does not strike. Whether we know it or not, whether we acknowledge it or not, Adi Para Shakti is already in our homes, in our bodies, in our minds, in our notions of I and mine, in our families, in all that we see – because She is the All-Pervading Awareness. We cannot lose Her without losing our life, because She is verily the life within us. Does the fact that we breathe require initiation? She has already initiated us into life as the Mother who gave us SRI, which means everything. She extracted the seed from our father, giving ecstasy to him; She assembled us from life-giving substances of Her own body, gave us our hormones and endocrine system, our bones, flesh, skin, blood and all; She made us atom by atom, molecule by molecule; and most importantly, She put Her awareness into us. Again, the Sri Chakra Meru is but one of Her forms, the others being (2) our own physical bodies; (3) the psychic chakras in our subtle bodies, from Muladhara to Sahasrara, seven in number; (4) the world we live in; (5) Hamsa Gayatri, the breath of life which goes in and out as long as we live; and (6) Siva Linga, symbol of union of Shakti (the Yoni base) and Siva (the Linga characteristic of the Godhead). These forms are not different; they are all one and the same, they all represent Sivayor Vapuh. The moment any one of them is present, all others are present in them as well. The gifting of this Meru involves a gifting of Power. There is no need to fear, provided that it is received from a well-intentioned Guru, because his life force goes into it then, and provided that it is accurate. Q: Accurate in which way? (3) it must be placed in the puja room, or else in a prominent, well-lighted place in the home with Vedic or mantric chants being played to it; or simply soft music. Light and sound are two higher forms of worship. Then the Meru will act like an antenna, first attracting the Supreme Power, and then retransmitting it all around your home, bringing good to all. Q: Why is the Maha Meru hollow? A: That’s a legitimate question. It was intentionally made hollow, because when the Guru gives the Meru to a disciple, he traditionally fills it with various life-giving substances, such as roots and herbs, energizes them, and then seals them off inside and gives that to the disciple. That is why it is kept hollow. But so many questions have been raised about the hollowness of the Sri Chakra! But it has to be hollow! There is no other way! Why? It is hollow because it is supposed to represent a viyat chakra – a wheel in space. And by the way, even if you are determined to make it totally solid, even if you think you’ve made it totally solid, still it is ultimately composed of atoms and molecules. And atoms and molecules have nuclei at their centers, which are like the Sun in the solar system – the electrons and neutrons orbit through relatively vast spaces around the nucleus. Even if you go to the nucleus itself, it is still not solid; it consists of stage particles. In fact, the whole nucleus is very hollow and inside it there are only probability waves traveling through. Thus even the supposedly “solid” atoms and molecules that make up the manifest world consist mostly of empty space. So it is not true to say that the Meru has to be solid – because there is nothing that is solid. Somehow this concept requiring solidity does not really stand up in light of scientific views. Q: You said earlier our Meru design is significantly different from that of a typical Meru. How so? A: This particular style of Meru was inspired by the design of the original that we unearthed here in 1984. It is embellished with the symbols of the Chatura Ayatana (“Four Seats”) deities – Ganapathy at Nairuti (southwest), Vishnu at Vayu (northwest), Surya at Ishanya (northeast) and Shiva at Agni (southeast). These four symbols, taken together with the Bindu (Devi), represent the Shakti Pancha Ayatanam (“Five Seats of Shakti”). The Shakti Pancha Ayatanam are present right in the Meru itself, thus making it very unique. People doing Shakti Pancha Ayatana puja need not obtain each of the idols individually, as the Meru itself contains them all.Another unique feature is that the Meru I found had extra diamond-shaped plates above the star shapes having fourteen, ten, ten and eight corners. They served to demarcate the triangles from the undefined areas, which seemed so much more logical. This was unusual. In fact, it differs from most Sri Chakra Merus to the extent that I don’t know whether it can be called a conventional Sri Chakra Meru at all. And on the other hand there was the accuracy – three lines joined without forming triangles – which was very good. This characteristic does qualify to make it a good Sri Chakra. Finally, the Meru is unique in the sense that a lot of care has been taken to ensure that the yantra is accurate. That accuracy comes from the very definition of the yantra found in the texts that define Sri Chakra in Hinduism and Vajrayana Buddhism. A: A limited number of copies of the Meru are being made It is like a collectible. It has a price tag on it. We’re making it in different sizes – 10” x 10” and 5” x 5” The “designer” type of Meru can be made in bronze, silver, gold, panchaloha [a traditionally holy five-metal alloy] – all sorts of possibilities exist. The material of which it is made can have a say in what it promotes. Gold makes it a Meru, because gold is supposed to be like Sun’s seed. It brings untold prosperity. Hiranya garbha garbhastham Hema bijam vibhavasoh. Silver is the seed of Siva. It promotes progeny and peace of mind, with fine arts and education. Copper destroys poverty and gives enough to survive above mere wants. Tin wards off and prevents evil from happening. Thus we recommend bronze, an alloy of copper and tin as a good choice for most. It can be plated with gold for better results. Recommendation:To Energize Residence, Shop, Office, Factory etc. of area up to 3000 Sq. Ft. & People there in. Also to place on the Table of Office Head, Cars, Buses & Trucks.